Lovely tip. Also works to find an iPad or apple watch. Saves the time of opening the find iphone app. This is a great trick! I probably misplace my iPhone a few times a week, and usually just call it from the wifes phone. 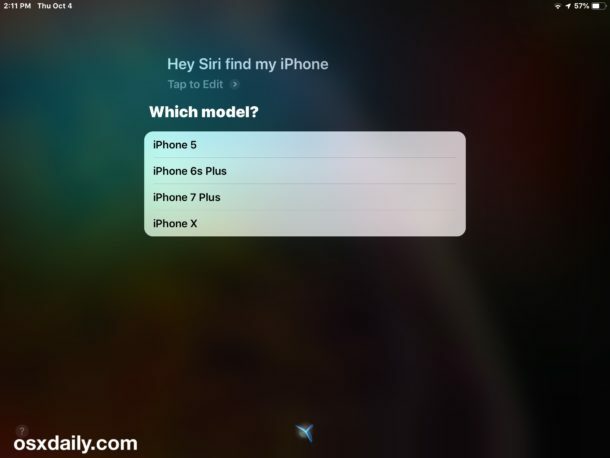 Louie is right, you can use it for finding iPhone, iPad, or Apple Watch. I have not tried finding a Mac with it yet but it should work with that too. 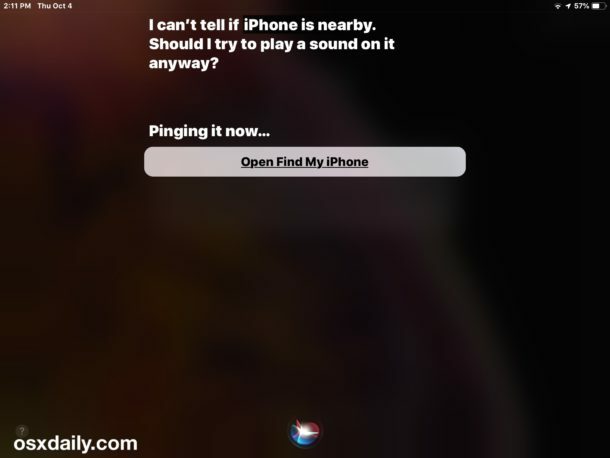 Hey Siri, find my iPad! 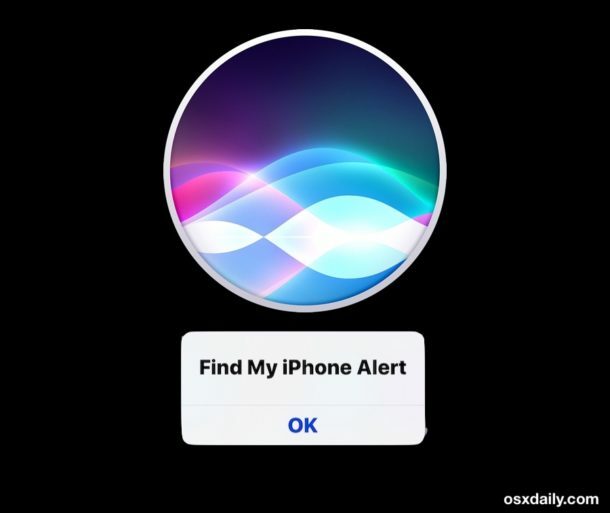 Hey Siri, find my iPhone! Hey Siri, Find my Apple Watch! Hey Siri, find my Mac! This is much easier than opening iCloud or the iOS apps for this feature. Great tip, thanks so much. Jusrt tried telling Siri to find my Mac. It does work! Does this even work when you have the sound on the missing phone turned off or if the battery has lost power? That’s always my problem since I turn it off and then forget to turn back on and then misplace it and then the next day realize i have misplaced it and by then the battery is worn done to 0%. No, if the iPhone is off or with a dead battery it will not make sound. But you can use a feature called “Send Last Location” to be able to find the last known location of an iPhone before the battery dies, which shows where it generally is on a map. Thanks for talking about this! I “lose” my iPhone in my house frequently and panic until I locate it. Now I can use Siri on my iPad or Mac to find it again! Nothing works if the phone is turned off. Except that Siri is unreliable rubbish. It works sometimes on my phone, but NEVER on my Mac. Just tried your tip and it sat there thinking about it for over 30 seconds before I turned it off again. The iPhone sits 20 cms away from my Macboook on the same WIFI, bluetooth off, Siri is installed, Find My iPhone is enabled. Exact same response. Is this another case of you must have the latest and greatest versions of both hardware and software??? Doesn’t work for me. Siri just tells me “I can’t help you with that” and goes on to say that I can get help finding my devices on-line. I’m using High Sierra – latest updates. You must have “Find MY iPhone” enabled on the iPhone, and iCloud used/enabled, on the iPhone you are trying to find. I have all that enabled, but still get the “I can’t help you with that”. 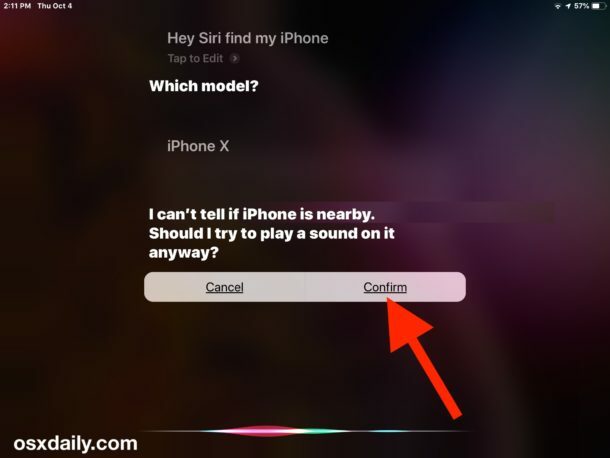 Like others, I get “Sorry, I can’t help you with that etc” when I ask Siri on my Mac Mini with High Sierra, iCloud and Find MY iPhone enabled. iOS 12.1 on an iPhone 8. Maybe it’s Mojave thing? Which would be too bad, because I have no intention to upgrade to Mojave as too many of my apps are not compatible with it. High Sierra works just fine, thanks.